Evergreen Building Group excels in making the most of all possible living space in your home. Often that means making the most of your dated or unfinished basement space. 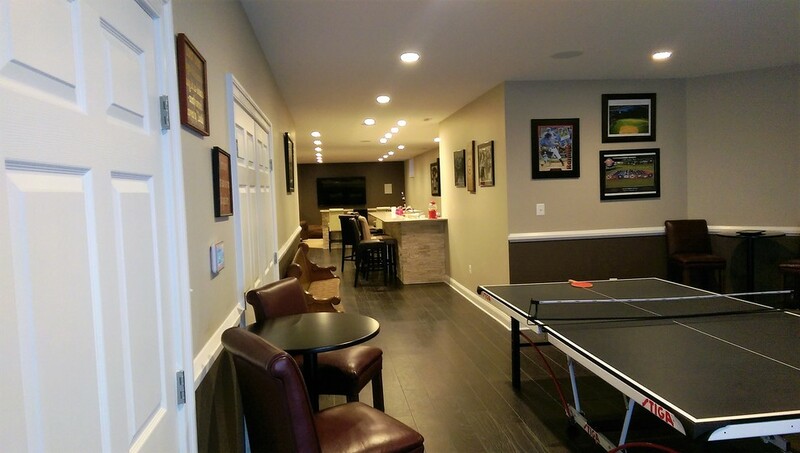 Browse a few of our renovated basement projects to see what we can accomplish. 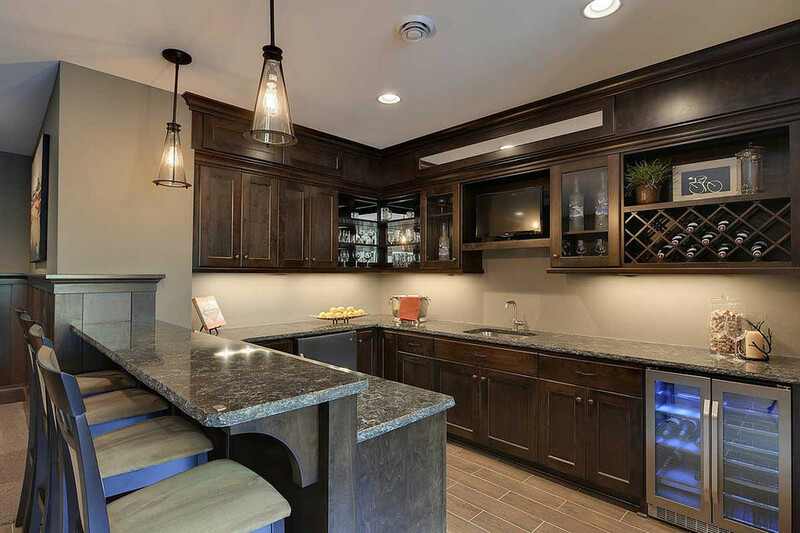 Beautiful basement bar with raised bar seating, pendant lights, wine rack, mini refrigerator, and dark wood cabinetry. 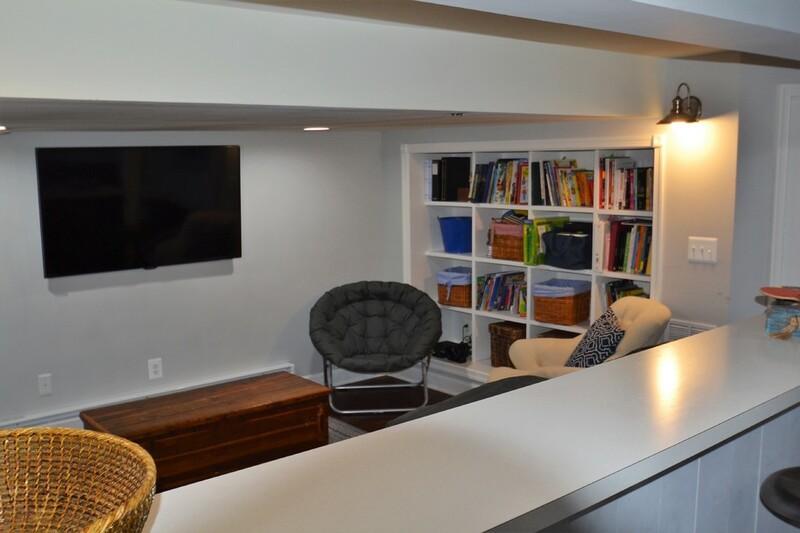 A basement tv room with built-in cubbies for storage adds extra entertainment area for the kids and their friends. A basement tv & game room with built-in cubbies for storage adds extra entertainment area for the kids and their friends. A basement tv & game room with built-in cubbies for storage adds extra entertainment area for the kids and their friends. A full basement bath completes the space. This basement offers full-size kitchen appliances, paneled dark wood accent wall, and a gas fireplace. A full range of living is available in this finished basement. The main living area features a large family space with stainless steel appliances, white cabinetry, recessed lighting, and engineered hardwood flooring. In addition, there is a full size bedroom,bathroom, and laundry room. A wonderful guestroom was created in this basement remodel. The full bath and large room offer lots of privacy.the full-sized window and ceiling mounted lights ensure a bright and inviting space for guests. A built-in entertainment center and a wet bar enhance this basement recreation room.The spacious floor plan, recessed lighting, built-in shelving and cabinetry make for a comfortable additional living space. This game room was made to pool and relaxing. Comfortable entertaining at it's best. This finished recreation room offers plenty of space to gather for your favorite game. The home bar, upgraded architectural details and recessed lighting all add to the inviting comfortable effect. The main room in this basement remodel includes a luxurious bar, ample T.V. seating, and pool table. The detailed columns, ceramic tile, cherry cabinets and beautiful fixtures complete this basements transformation from drab to fabulous. The mosaic glass tile, marble countertop, and dark cherry cabinetry make this a stand out basement bar area. A large recreation room includes an open area for the pool table, luxurious bar, generous T.V. space, and built-n shelving. A theatre room off the recreation room allows for private viewing. The final touch to this basement renovation was the addition of a home gym. Dark wood cabinets contrast with the light natural stone backsplash to create a classic yet beautiful focal point in this basement remodel. The built-in glass cabinet is a perfect spot to display valuables. A knee wall is used to create additional bar seating; a terrific spot to socialize and watch the game. French doors add plenty of natural light. The large open space allows for various additional activities to round out the enjoyment of this recreation room. Beautiful stone finishes combine with stone tile and french door adding additional charm.